Thomas sticks out because of the dearth of information about him. He did not leave behind anything of a glib, or even querulous, nature. No, he was there and effective; and, he left his progeny. We have already mentioned that being free with words was a trait that seemed to come to fore here, in the first land of freedom. Hence, Thomas can serve as a proxy for our look backs. Just like the "WWJD?" question, we can ask: what did Thomas think? On reading Thomas Prince yesterday, I marveled at his scholarship and energy. His 1736 publication (Vol. I of the Chronological History of New England) had several pages of references. Luckily for us, Prince had read Rev. Hubbard's manuscript (finished in 1680, it was almost lost in the mayhem related to the tax issue - at Hutchinson's house which was trashed and burned) and used it. Hence, we have the first reference of the role of Thomas and John (Tylly, of course) in a look back that was only 100 years after the fact. Of course, all sorts had their memoirs. I'll keep looking for the first reference, but, right now, it seems to be Hubbard (printed first by Prince). Now, coming over to this land brought out several latent characteristics that had evolved over centuries. Think of the youngsters now running off to college and parties (and dire straits, many times). Same sort of thing; yet, some were more mature about it (hint, Thomas and his ilk). Others took their new-found power a little to far (despots, essentially - who? do I have to enumerate the whole set for you?). I will redo Prince's bibliography in a modern format. It's really impressive. Many of these are in digital form, hence we can read them (so, we'll link to the on-line material). But, looking at his work reinforced some notion that I've rolled around [in my mind]: you have to go back to the original sources, folks, to see what the person said by reading it yourself. As we would know from information theory, we have people expressing their opinion, then that opinion generates a retort (many times the original source is not reviewed to see what is what) and so forth, ad infinitum (it seems). We have to go back to the original source (which implies having it available and not just quoted by some later dude -- now, there may be additional information about motivation, milieu, etc., which all can be facilitated with the internet -- listening Zuck? -- what is this crap of claiming territory and making oodles of money -- yes, the cyber realm's landscape is being as screwed up as was the 1st world's). The coming Gardner's Beacon issue will provide, hopefully, a new start on some of this stuff. The original basis will be minimal (somewhat). The clamor accelerated with the advent of New England's reality, prowess, (in Thomas Prince's work, the scope includes all, not just the northern part that was started by the errant Pilgrims of 1620). The clamor reached some peak around the War of Revolution. However, the internet age has caused a worldwide surge (that is, beyond the huge amount daily captured in the Congressional Record). Lord help us (as in, who can eat or wear this vaporous thing that does not even have any semblance of being? -- ah, money as an analog). See Vol. II, No. 6 of Gardner's Beacon for a look at the legacy of Thomas and Margaret () Gardner using an Annals format and being accompanied by a bibliography (with links to digitized versions of references). In 1995, the Great Migration series had its first publication. Over the next few years, the early settlers (1620-1633) were covered in three volumes. If we take the first three "governors" and their coverage, we have this: Thomas Gardner (six pages), Roger Conant (eight pages), John Endicott (seven pages). This publication covers what is known about the settlers at this time. As such, though, there is a lot of material that is not referenced. Too, a look back, such as the Great Migration one, can cover 1000s of people and cannot get into as much detail as we might want. We have to go elsewhere, and, frankly, the sum total of information that I have seen can be less than clear, for many reasons. One such controversy is how many wives that Thomas had. There are others. 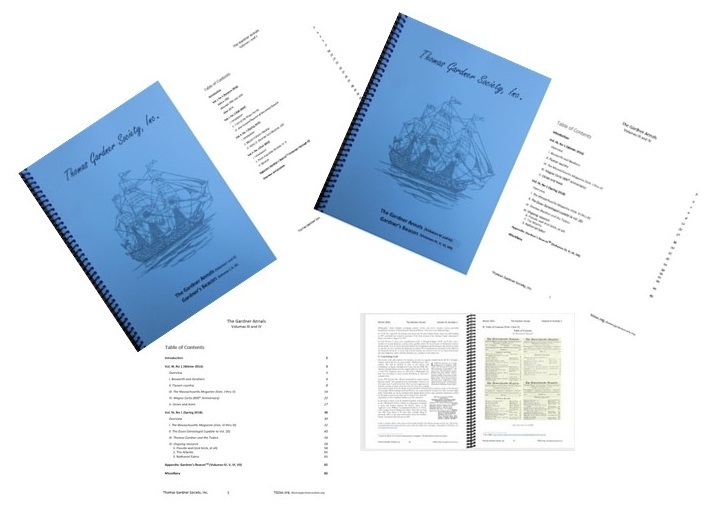 For instance, on March 20, 1999, a talk at the ESOG (Essex Society of Genealogists) by David Goss looked at the Old Planters of Beverly (TEG, Vol. 19, pg. 123 -- our earlier take on the subject in 2011). He described how the term came about and to whom it applied. From the Beverly-group's perspective, the names are familiar as they've been used in many papers and books (Conant, Balch, Trask, Woodbury, Palfray). These were, in other words, the stalwarts of John White or the group led by Roger Conant (Reminder: the Beverly group did not get their land until 1635 - we need to talk about the time from 1624 up til then, more or less). 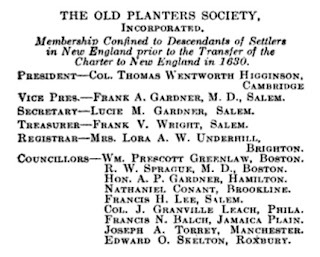 Along this same theme, we saw, in 1899, the founding of an Old Planters Society whose membership included those who had ancestors who came before 1630. That effort was led, in part, by Dr. Frank. A. Gardner. Dr. Frank A. is noted for his books on Thomas Gardner and his descendants using material that he had gleaned through a lifetime of research. It is of interest, that in the early 1900s, the group seemed to be a Balch/Gardner reunion (Benjamin Balch's/Sarah Gardner's descendants). The latest events have a flavor of the History of Beverly. The 1899 group talked about the injustice of history overlooking these early planters and wanted to correct the matter, ostensibly before the 300th anniversary. We're preparing now for the 400th. 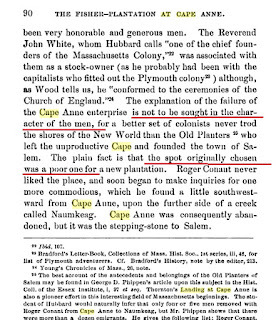 David's paper, which I ran across recently, was the latest find during a three-year search and review, by the blogger, of all material related to the Cape Ann group. This long effort, essentially, looked in all corners and created a huge pile of material (searched with a very-wide net). Now, the task is sifting through the huge pile, developing a bibliography, laying out a timeline, and building a view that can go further as support for future research. That motive of this work is to honor Dr. Frank's work and to present a coherent, and as complete as we can, view of Thomas. Too, many conjectures have been presented which do not fit the bill, otherwise there would not be the controversy (unless one expects that these types of things are not resolvable). The current issue presents the material in a timeline by year, up until the present. In doing so, it hopes to show a view that makes sense. The timeline is not complete; rather, think of it as an outline from which we can define research projects that will clarify, fill in, information. If done correctly, this type of timeline would become more and more strong such that future people with interests in Thomas and Margaret can use it as a launch point. That brings up a new view though. Thomas' crew put together a house their first year. Too, they did come prepared and were successful in establishing themselves. 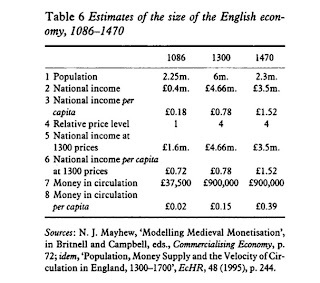 The only failure was not having sufficient output to send back to the capitalists in England. What White may have wanted was for them to send what they needed to sustain themselves, but reasonable folks do not do that without the threats of the taxman or strong arm (those who came here were not serfs, in other words). When Conant showed up, he didn't find starving people. He found a boisterous group. The use of insubordinate shows White's failure (hey, the descendant of Thomas has White on the tree more than once). The effort was not a military expedition. It was a plantation building effort. Here is the thing, though. When Conant and his group went down to Naumkeag, it was not an all-in-one trip. Whoever thought that has not had to deal with the real world. We're talking a trip that could be taken by a good man in a day. By water, the trip could be less in the right conditions (look at the image which shows an entry from Winthrop's diary - courtesy of Judy Jacobson - in which he talks of going to Salem, eating, then going to Cape Ann, for dessert, so to speak). 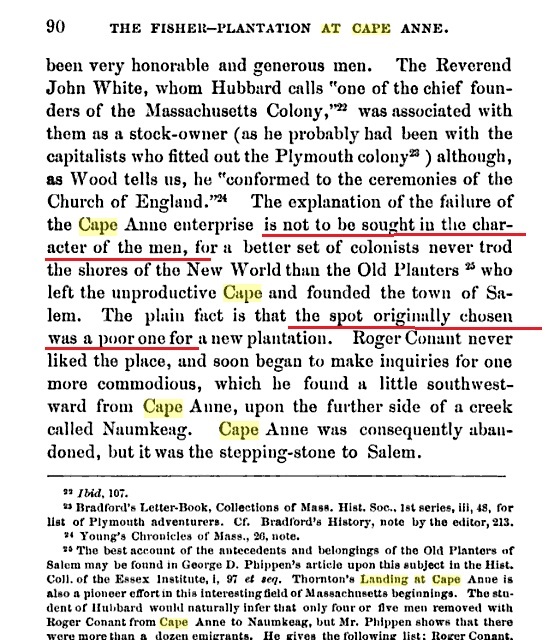 Too, Thomas' group had established themselves at Cape Ann (which is a real nice place, by the way). There was the house and other dwellings. They had gardens. They had cattle. They could fish. There was game. Who the heck sees this as failure? The movement over to Naumkeag took time and many trips. 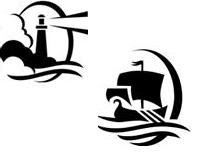 What ought to be considered is that Thomas had a presence at both places, but he was principally in Cape Ann. He could take care of (and feed) himself and his family very well. Now, when Endicott showed up and pushed Conant aside, he saw Thomas in the Cape Ann house. He liked the house and had it moved to Naumkeag. Too, though, Endicott knew that Thomas was of the "Mr" variety. Hence, Endicott wrote about him (the 1629 meeting mention). Due to the lack of "press coverage" as we expect nowadays, Thomas might be considered peripheral by some, but so what? He was taking care of his own. Most likely, he helped other people, too. And, why would he follow Conant? Too, as said before, Thomas' proof of being is his progeny. And, being, folks, is still the reality (we have seen plenty examples, of late, of effective people who do not announce their deeds prior, or even ex post facto, to accomplishment). Thomas was not a freeman (as if he needed someone to set him free) until 1637. He joined the Church the year before. But, he was signing things, like land grants, before this. In other words, he and Endicott got along, so Endicott gave him some responsibility. But, as we know how people are, the Church people noted that Thomas hadn't shown up (in modern parlance, took a boondoggle to Cape Ann to look at the crops when service time came around - okay?) so they had to rope him in. Also, Thomas knew that his kids would have to be of the social element in order to have any success. So, he deigned to join. Not long afterwards, though, he married a Quaker. Do we hear of anyone threatening Thomas (Endicott would know better!) on this? We have not seen such documented. And, this type of thing would have been recorded. Also, it was not that Thomas was a bully causing people to fear him. Rather, his stature (I would presume from what I know of Gardners) was above normal; he have a solid, and large, character; and he was a man's man of the peaceful type (the Natives loved him). In other words, the preeminent individual so loved by Emerson (in his mind - by the time of Ralph Waldo, too many of the elite had ruined things for the rest - that is part of the Thomas story) was here within the first generation (actually was the first generation). That first group, all of them, had remarkable characters. They did not fail at Cape Ann. When Endicott got here, he did not find starving, helpless people. But, guess what? Not long after Endicott arrived, here came boats of people (too many) who swamped resources. At this time, Thomas would still have been house-sitting where they were well-provisioned. He probably helped move the great house (1628/1629) from Cape Ann to Naumkeag (at least, he probably was able to do this - of the many that we read about, they would be about as effective as a slug for any useful purpose -- unfortunately, history's details are about such and not those who can get, know how to get, things done). 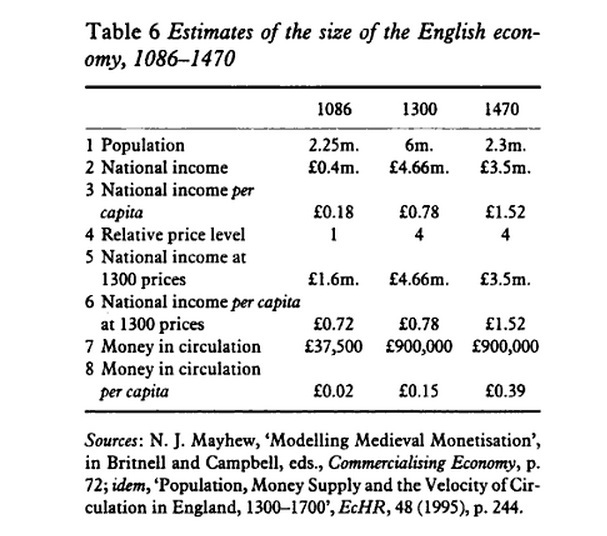 The winters of 1628 and 1629 were dire due to the influx of the unprepared, and the results were catastrophic. We'll have to touch on this in our research. By the time Winthrop arrived, though, things were going great again, though, due to efforts of people like Thomas. Aside: Salem, the wallflower? This little city ought to be as beloved as is San Francisco, for many reasons. Why is it not? 03/27/2019 -- Image added to the index on our portal to truth. .01/08/2013 -- Added a forum to facilitate discussion, etc. 12/30/2012 -- 2nd edition, with changes, published today (see Afterthoughts & Modifications for this volume). 12/29/2012 -- In Afterthoughts & Modifications, mentioned the David Goss talk in 1999. 12/29/2012 -- Beacon issue uploaded with the start of a Bibliography with links to digitized versions of reference material. 12/25/2012 -- The issue will be completed this week; this advance notice is a Christmas gift to Thomas descendants, and friends, who wondered about the times after Cape Ann. I'm researching for the next Beacon issue which will have a brief timeline of the lives of Thomas and Margaret (it does a grand sweep of their times and after all the way to today). Hopefully, it'll point to areas where we'll focus effort in the future in order to expand upon the theme so as to leave the proper legacy. I can thank Rev. Felt for phrasing some thought (read today) that I've had for three years in regard to Thomas (see Backbone series). That is, Felt gave me the proper concept to use. You see, how is it that there is such a lack of information? How can all of the written literature be so sparse in regard to his life over all of this time (from the beginning down to recent publications)? Even Anderson, et al, (Great Migrations) seems to write begrudgingly. The below image is taken from Thornton's (1854) The Landing at Cape which tries to document the experience at Cape Ann (which has a bunch of unknowns). This book references Thomas only once as the plantation overseer, with Tylly, at Cape Ann. And, it is in the beginning, as in, pre-Conant. Other than that, there is nothing (based upon quick scan - so I may have missed something - the issue would remain, even so). 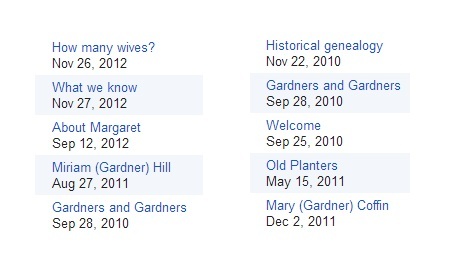 Aside and disclosure: The wife of the blogger is a direct descendant of Thomas and Margaret, however she is also descendant of Conant and others of the old and new planters. One might say that I'm continuing Dr. Frank A. 's argument about the injustice, in general. We'll get to that in the Beacon issue. Felt is talking about Roger's continuing displeasure at his treatment. But, the dear guy ought to have considered his treatment of Thomas and Margaret (he got the house!). 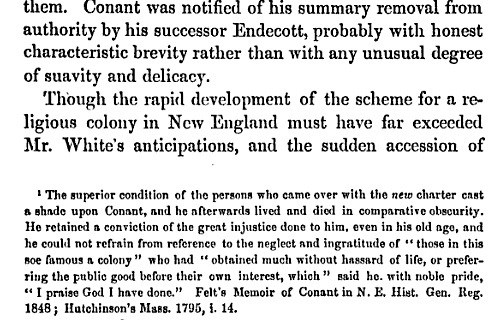 The image quotes that Roger "retained a conviction of the great injustice done to him, even in his old age, and he could not refrain from reference to the neglect and ingratitude" referring to Endicott's arrival. Notice that Felt says that "the new charter cast a shade upon Conant" which implies his followers (Balch, Palfray, Woodbury, Trask). A 1999 talk on the old planters of Beverly (we'll use this in the Beacon issue) said just that: Conant and his followers. These people worried that they might have been enslaved with the change in the power structure. It was so troublesome that Craddock had to address their worries, explicitly. Too, they were given the land in Beverly in order to bolster their spirits, so to speak. And, old Thomas? Cool as a cucumber (as I've said, a guy who was effective, knew himself, and was the chief manifest'er of what was to become the American -- you think that London, et al, liked this?). Now, none, nor any incident, that I can see, cast a shadow over Thomas. References to him imply dignity, respect, and more. On the other hand, he was ignored in writings, perhaps to put him in his place, as if that could happen. Too, Thomas' stance was of the true American that we were to see develop over the succeeding centuries. One attribute of that stance was to be distant from the Churches (yes, plural -- ah, we can go on about that ad infinitum, but won't). Thomas was no follower; his blood and pedigree prevented that. Now, too, his sympathy toward the Quaker thought, and the fact that his last wife was of that faith and that some of his sons were, to boot, talk of a mind that encompasses the shebang (put it this way: the every man view with both breadth and depth -- the latter, of course, meaning all classes -- those higher casting a shadow over the lower - hey, only those that you allow can cast a shadow over you). Yes, the Quakers were forward thinking and exhibited more than any a spirit of inclusiveness and peace (we'll have to get back to John Goff's take on King Philip -- we overlook, too much, our mistreatment of the natives - starting with whom? Endicott?). However, we do not to want steal thunder from Gardner's Beacon. These topics all deserve careful study so that going forward we can have the proper view and respect for this UNKNOWN couple. As it says: honor thy father and thy mother (albeit transitively if necessary). 03/02/2013 -- This may have appeared in another post, or Beacon. However, we'll repeat the thing here. When Thomas took the freeman oath, that is, that year, he was voted to the General Court with Hathorne (see above, another great-grandfather) who was a swashbuckler. It is interesting that Thomas, after that, kept a more local focus. There may be many reasons. But, getting up close with the clamorous ones may not have fit his mindset. You see. Throughout history, certain people get written about. Yet, in any situation, there are teeming amounts of more people who are not in the spotlight. Now, do you think that not having attention diminishes your being? If you say yes, let's have a little discussion. Of course, we would have to define, up front, whose attention. Social media comes to mind; frivolous content that invokes brain altering reactions (say what? -- I'm happy that I'm not susceptible, being too many decades old, long-in-tooth, if you would) to those who participate. So, back to Thomas and William. You see. John Endicott knew Thomas. John picked on poor Mary Dyer and others. William probably did similar deeds. Thomas? There are not bad tales. Too, and this is a big too, he deigned to be involved with people who were outcasts, namely the Quakers, as were his sons. Now, the sons left. Thomas was right there in Salem, of major stature in the phenomenal sense. Actually, his recoil (my take which can be explained) from the politicking tells a lot; it has a lot of meaning, not unlike George (the first Prez) stepping down even though he was adulated sufficiently for people to want him to be sovereign (thank you, George - for showing us that term limits ought to be part of the deal - professional politicians? say again?). 12/25/2012 -- John Endicott knew Thomas to be exemplary (though, not military). 12/24/2012 -- We'll also point to academic studies, such as that shown in the image (Essex Institute and Johns Hopkins University). It says, don't look at the character (ah, John White? uncle? who needs enemies with family like that?) but consider the place as not appropriate (no aspersions meant for the lovely Cape and its environs). As suggested in the Wikipedia article, Old Planters (Massachusetts), there are many types of old planters. In the case of New England, this Wikipedia article needs to be expanded to include many other places, such as Boston. Earlier, we mentioned Old Planters with the context of a reunion at Beverly. Too, we broached the subject while asking about the history of the area, essentially Essex county. Research, to date, seems to indicate that a recap of mentions of Thomas from early times on might be an appropriate undertaking. 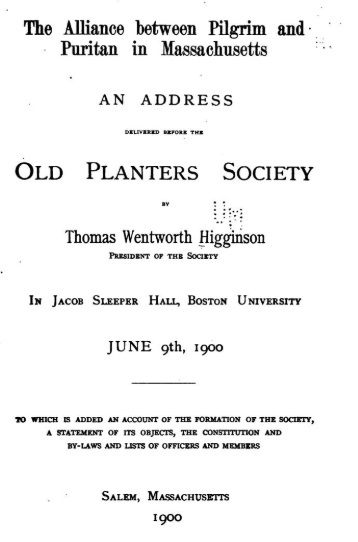 For this post, we'll make use of what might be the first publication of the Old Planters Society that was active during the early part of the 20th century. The book is on-line (archive.org, Google Docs): The Alliance between Pilgrim and Puritan in Massachusetts, 1900, Thomas Wentworth Higginson, Salem, MA. The book contains an address by Thomas, the President, to the Society in which he looks at cooperative efforts, and the influence thereof, between parties who ventured over. These parties would not have been so inclined to such behavior across the pond. In essence, the coming over brought forth means to establish a new society, albeit troubled in many ways. The topic will arise again, in regard to Thomas' and Margaret's lives, so we'll leave it at those few words. The real interest, at this point, is the summary of the Society which was instituted in 1899 (our task will be to pull together a more full history). Evidently written by Dr. Frank, the summary explicitly mentions Thomas. One thing in vogue then (many references which will be collected) was to cure the oversight of many people who were in the parties. That is, the historically covered people shadow the reality of the others (always has been the case - but, changes, such as we see with technology, indicate that this will not be so much so in the future). See page 13; it says that "injustice" was done to some planters. It also uses sympathy which is not the intent here; rather, the focus is to establish a more full interpretation that removes the oversights, or, at least, explains their longevity. The book has the Constitution of the Society. Article III, Sect. 1. defines an old planter as follows: lineally descended from, in the male or female line, a proprietor, a planter, or other settler in New England prior to the transfer of the Charter of the Massachusetts Bay Company from England to New England, in 1630. 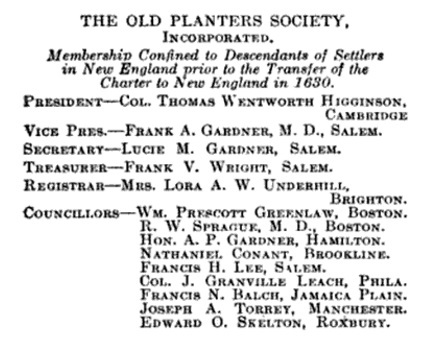 The book lists the Officers and Members of the Society. Higginson was President. The VP was Dr. Frank. The following list is taken from the members' list and includes those who have Thomas on their application. Some of the others may also be descendants (marked as **, we'll scrutinize the list, at some point) as they may only be listing a primary ancestor and not considering supplemental applications via other ancestors. 01/12/2019 -- Col. Higginson supported Kansas as a free state. 01/06/2019 -- At the 300th, there was a Pageant of Salem represented. In Volumes III and IV of The Gardner Annals, we printed the Table of Contents for all issues of The Massachusetts Magazine which last printed in January of 1918. 11/26/2016 -- In the next issue of The Gardner Annals, we will look at the editors, such as Lucie. M. Gardner. She was the sister of Dr. Frank. 04/02/2016 -- Last summer, we went through The Massachusetts Magazine (Vols I thru XI) versions that are available on-line. "Old Planters" was a regular section. 1675: December 19 - Captain Joseph Gardner, who set out from his home on the present site of the Essex Institute, is killed. (pg 28, Chronicles of Old Salem, F.D. Robotti). On that day, the colonists lost a lot of officers. The Great Swamp Fight was an engagement in the King Philip war. At this particular fight, 220 colonists were killed or wounded. John Goff and Julianne Jennings wrote about King Philip and the conditions that led to the war, earlier this year. As we noted, the Gardners, and others, had peaceful relations with the native population on Nantucket. Looking at family history, and genealogy, can by transitivity be seen as obeying the 5th Commandment. In a more full sense, that would include all of the children of a couple. Many folk do not have progeny who are here now that would remember them. So, we'll be sure to start that, perhaps as a meme. So, given the honoring of those without issue, we would have the aunts and uncles. Perhaps, by extensions, cousins without issue would be remembered, too. Finally, friends of the family deserve attention, as we show below, with one example. Gardner's Beacon featured Joseph and his bride, Ann Downing, in the Valentine's issue. The couple lived in a great house that they received as a gift from her parents, Emanuel and Lucie (Winthrop) Downing. Joseph and Ann did not have issue. When he died, Joseph left a widow, Ann. As the Beacon issue noted, Ann was very well educated. Yet, she, and her house, are now mostly known as having been associated with Gov. Bradstreet. It's interesting to note that Ann, prior to her second marriage, presented Simon with what was essentially a pre-nup. Was this the first of its kind on this continent? We have mentioned many times the fact that Thomas and Margaret have been written out of history (my take, personally -- various motives will, eventually, be conjectured for this). The tone of the current post is remembrance. One friend of the family is John Tylly who came over with Thomas and Margaret to Cape Ann. John was a co-leader. He was killed in 1636, as an early casualty of conflicts with the native population. Genes and memes seem to be topics of increasing attention nowadays. Perhaps, the interest might be cyclic, such as the up rise in publications at century markings. Around the 300th anniversary of colonial times (plus or minus, of course), books on family and genealogy came into vogue and appeared in droves. Any large library has several thousand of these. We are coming up on the 400th anniversary. It'll be interesting to see how celebrations of the event unfolds. Memes (to be discussed further) will be one key thing, IMHO. 03/11/2014 -- anceSTORY mentions that what is referred to as the Governor Bradstreet house (Simon's will says that he had a pre-agreement with Ann prior to marriage) has another story than suggested by Perley (and a study of Essex Registry of Deeds). Need to check this out. The blog got its start on September 25, 2010. We're a little late with a two-year look back (see Posts of Interest - 2011), however it might be appropriate to review some of the statistics over the period. Before today, there were 75 posts. These have generated six categories, the largest of which is Descendants who have mostly been of earlier times. Perhaps next year, we can feature some recent descendants. The image shows two lists which contain the most-read posts which can also be taken to be the most popular. Of late (left column), the How many wives? subject has been of interest. Some say that there were three. The post explains why we say that there were two. Since the beginning (right column), there have been two popular posts. Historical genealogy tells the story of the demise of Richard III and the involvement of a Gardner. Gardners and Gardners is an ongoing effort to identify all of the Gardner families, say before 1700, and their relationships. From time to time, we will do a snapshot like this so that we can show interest by time. Based on the above, Gardners and Gardners post might be the most popular as it is on both lists. There were 13 posts in 2010 over a three month period. Last year (2011), there were 38 posts. So far this year (2012), we've had 25. As with any publishing, there needs to be a way to make changes to Gardner's Beacon issues after the release. Several are pending, but we're starting with the recent release and its counterpart from 2011. Entries will be separate, with a header. But, they will be in reverse order. See, Afterthoughts & Modifications at the Beacon site. Vol. II, No. 6 -- Following changes incorporated into a 2nd Edition on Dec. 30, 2012: Page 1, change 1592 to 1492. (Before 1623/24), Son, Richard, was born in 1621. Page 2 (1623/24), Thomas, George, and Richard came with their parents. Page 3 (1630), Winthrop went southwest rather than west. 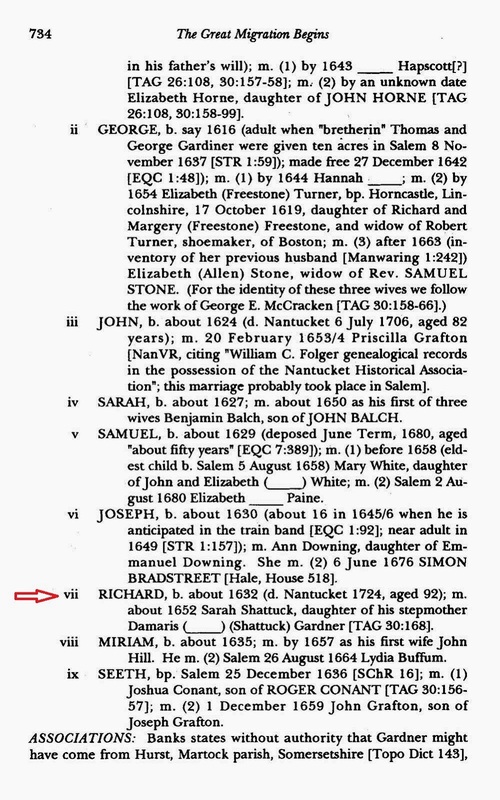 (1635), remove that Richard was born in 1632. Page 5 (1935), change to John Lowell Gardner II. (1999 New entry), On March 20, David Goss talked to the ESOG about the old planters who received land in Beverly. Thomas Gardner was not in that group see (Discussion). ... This Annals view is sketchy, at this point, and not complete. It will be filled in (and edited) so as to provide a sound point of reference. Vol. II, No.5 -- In regard to the 1992 exoneration, it should read that, in that year, the Massachusetts House of Representatives issued "a resolution honoring those who died" during the time of the trials. In 2001, Governor Jane Smith signed an exoneration for the remaining five: Bridget Bishop, Susannah Martin, Alice Parker, Wilmot Redd and Margaret Scott. Others had been exonerated,earlier. Vol. I, No. 4 -- Where there is reference to Giles Corey's sons (2nd page, 1st column, last paragraph), it ought to have been his sons-in-laws (and his daughters). 02/12/2019 -- Gardner's Beacon is now in its ninth volume (last issue, Vol. VIII, No. 2). As well, we have a new site at which we'll work at new ideas for presentation: TGSoc.org. On the Publications page, we will provide an additional facility for handling submissions of Comment & Criticism. This was a section in Dr. Frank's The Massachusetts Magazine. The Gardner Annals is now in its fifth volume. We have had two print releases, so far: Vols I & II and Vols III & IV which included issues of Gardner's Beacon, Vols I thru III and Vols IV thru VII, respectively. 08/15/2014 -- See Source Change, Vol. IV, No 1. Issue of references: Genseric (the Vandal) or John Fiske (we know the latter is the author - the question arises: why lift this whole book to a particular site when archive.org has a perfectly good digital copy that is free to read? is it not obvious that duplicates, such as this, can cause some problems to come to fore?). 03/27/2014 -- While reviewing the site, I found a couple of misspeaks in Vol. I, No. 3. 12/30/2012 -- More corrections added. Set up for, and publish, the 2nd edition. In the context of the last Beacon (Vol. II, No. 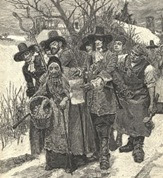 5) which considered the roles involved with the unfolding of the events of 1692 in Salem, the point was that many, who are alive now, have a mixture of ancestors who would have been, collectively, in all of the roles. So, then, one might think of calling a family meeting to discuss what was going on, in their heads, at that time. This type of gathering could not have happened at that time. The 'family' is a larger collection, having been built up through time. And, it's the insulation of the years, and generations, that allows our viewpoint and creates the fan-in of influence from several converging family lines. At the meeting, we would not invite the accused or executed to sit at the table. They are those who bore the consequences. We'll let them observe, quietly. Not that those who were accused are a small group. For a modern individual's tree, the accused group could contain tens of people, with more than a handful having paid the ultimate price. Some of the families might be like the following list: Aslet, Ayer, Barker, Bradbury, Bradstreet, Clements, Dane, Dutch, Hawkes, Hooper, Howe, Jackson, Johnson, Lord, Marston, Osgood, Parker, Perkins, Pratt, Solart, Wardwell, Wilson, Wright. We want to talk to those who felt that they had to mete out the consequences. What about the accusers? That's a whole different issue. What we want to do is gather together those who were responsible for damaging lives plus those who were very much vocal in opposition to what ensued. Perhaps, some understanding might come forth. Plenty has been written about the subject, including several well-known literary pieces. By the way, a modern collective viewpoint would not have been possible at the time that Nathaniel was considering the role of his ancestor and possible invitees. Invitees? Suppose that we took a cut across a tree at a certain generation (plus or minus) of that time. Tree? Yes, starting with a modern person, such as yourself, you have your parents, then their parents, and so forth (a power of two). We can pick any generation and collect the people who were alive then. We would select a number of young adults (which would be large group given how far back we are talking). For each of these young adults, we could consider a relationship with the person who [would] be invited to the meeting. Remember, these young adults, being on the tree, are great-grandparents of the current person who is anchoring the tree and that they were alive during those times. Hence, that young adult would have parents and grand-parents. As well, there would be aunts and uncles and cousins (usual affair, with siblings of parent and niece/nephew of the parent). The prior generation for this young adult (or these young adults) would have 'great' attached to it with the usual meaning (great-grandparent or great-aunt or great-uncle). Now, great-cousin, of course, would be the cousin of the parent. The Invitee list, shown below, is an example of what could come off of a modern tree. 02/01/2013 -- Aside: As far back as are these times of turmoil, everyone has over a thousand ancestors in the mix. So, having a large fan-in from all of these players is not unusual. Being able to document the fact is where the issues arise. The table is not meant to be complete or considered as such. Rather it is to illustrate a point and to facilitate the look backs that will be coming. Too, it shows the mixtures that are possible and that are of interest. What a mix! We see plenty who sat in judgment. Too, there are those who provided the rationale, usually with the devil as a central theme. Then, we have four who were anti-trial, God bless their souls. There are many other mixtures that it would be interesting to hear about. In this case, it is nice to see the opposition set, that was quite vocal, yet ineffective sometimes (not in all cases, as there were successful attempts to save the accused). There are many ways to look at these types of mixtures; but, each time that there is a re-look, it's not hard to find parallels with today's problems. 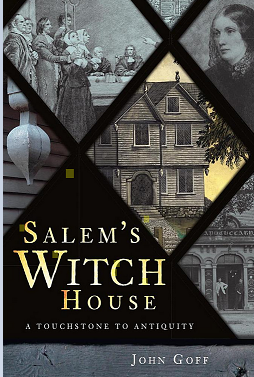 Perhaps, that is part of the eternal fascination with Salem of 1692. Looking at this event speaks some type of truth. 10/31/2014 -- Gardner Research: "The Trials of the Wilson Family" (also, TEG (2014) 34:155). 09/03/2013 -- Boosted up the font on the image caption after reading of Rev. Francis Dane's extended family and their ordeals. 06/10/2013 -- Having spent some time collecting text-oriented media (books, etc. ), decided to see what video has to offer. After all, that technology is the core of many new formats for socializing. Well, there is a lot of organizing to do of this information (and other media, to boot). For instance, there are many educational items, going back to the early years of filming (tape based). Then, we have the more recent. After running across this little thing by Lady Gaga, had to put a link here for future reference. She does, after all, have French Canadian roots, meaning ties to these times, albeit in a locale a little distant from the mad milieu. Then, one can find a copy of Kirstie Alley's movie on youtube. So, media, examples, and good context ought to be the task. 02/01/2013 -- Hill's book is a great resource for the newcomer. There was some history to discuss prior to the event, and she lays things out in an almost chronological framework. Not sure that I agree with her assessments in a few areas, but that's to be discussed later. Turns out that here may be some associations (primarily, in-law) with the accusers in the above context of a meeting but haven't seen any as ancestors, as of yet. It's interesting that Gen. Israel Putnam was a son of Joseph who sided with Israel Porter who is mentioned a few times as voicing opposition. 01/26/2013 -- Special mention of Sarah Good and her daughter, Dorothy (toddler). 11/14/2012 -- Throughout history, witch hunt occurs so much that we can consider it to be a meme (we'll get back to that theme). 11/12/2012 -- Added in the names of some of the families of the accused as family members would have experienced the turmoils, too; also, friends would have felt an impact. It's hard to image this type of thing in our generally peaceful times, at least domestically. Yet, we see 'witch hunt' used quite a bit nowadays. The image shows one harmless victim being harassed along the road to trial or to jail. Salem's reputation is always of interest, but it is even more so at this time of the year. We stop to take a look at the events related to witch trials, from the perspective of those who were there and whose descendants, in these current times, are spread far and wide. In the issue, we look at how some descendants have worked to establish Memorials in the area. For instance, the TerCentenary Memorial, put into place in 1997, was re-opened in September of this year after being closed from some refurbishment. The dedication ceremony was attended by members of The Associated Daughters of Early American Witches (ADEAW). The group was founded in 1987 for those women who directly descend from someone who was accused during that time. Those accused were both women and men. John Goff writes about his preservation efforts for the Pioneer Village in Salem which was built for the 300th anniversary of the founding. See Vol. II, No 4 for a look at Dow's work. George Francis Dow included a replica of the Great House (Cape Ann) that was moved to Salem by Endicott in the village (Pioneer Village) put together for the 300th anniversary of Salem around 1930. John also did preservation work in the area of the Corwin House (2009, google.com, amazon.com) which is of interest to the theme of this issue. This house is one of the few remaining artifacts that can be associated with the period. In his book, John describes nicely the area of Naumkeag (later Salem), before the advent of the English planters in order to establish the fact of long time occupation. In fact, the area was frequently used by the Native Americans for catching and handling seafood. John's book looks at the families who were involved with the house or who lived in the immediate area. We will look further at what we can learn from John's book. He makes a brief mention of Rev. John White. As well, John wants us to better understand the Native American frameworks (see King Philip, for example) in order to improve our appreciation. The current issue also takes a look at the fact that current descendants may have a mixture of lines, basically being an offspring from those who were in most of the roles that were played out during the unfolding of the mania. That, of course, includes those who were critical from the beginning and who were of sufficient authority to speak out (unfortunately, the Court did not listen), as well as those who were accused and, even, those with official duties. So, we ought to consider the types of roles played and what they might mean. Many of those who were jurors later apologized, deeply. And, there was official cleansing of those accused, albeit for some not until the 20th century. Finally, we always must remember those executed and the meaning of their lives. See Vol. II, No. 5 of Gardner's Beacon for these considerations of the events of 1692, at Salem and its surrounds. 10/30/2013 -- I am in the process of reading Katherine Howe's book, The Physick Book of Deliverance Dane. Dane, as in being related to Francis, of course. I wondered if there would be motivating material for a Beacon issue (we did have 1692 as a theme in 2011 and 2012 - we'll do a post on this subject sometime other that the Halloween period). It is an interesting plot, especially the balancing of the characters, and their interactions, in two time periods is nice. The description that Katherine provides of little Dorcas Good in the underground cell surely depicts the poor, young thing's misery and shows Katherine's grasping of the horror. One wonders, from some of the modern views and comments, if people really understand the dire situation. Too, the main hypothesis might have some truth, in a slightly altered construction. You see, science has not shown as much light on human matters as some might think. But, then, for any knowledge that we have gained, we have also seen that the unknowns do not diminish. It's just that we get better able to cover (as in, remove from awareness) the holes in which lurk the demons. 01/26/2013 -- Updated this post to add reference to Sarah Solart Poole Good and her four-year old daughter, Dorothy. The tot was imprisoned and interrogated by the idiot elders. Sarah was one of those who were executed. 10/29/2012 -- See Afterthoughts & Modifications. 10/29/2012 -- Imagine a meeting.